When I arrived at work this morning, helicopters were hovering over the financial district, where I work. I checked Twitter and found out that protestors were outside a bank headquarters nearby, so I grabbed the office camera and walked over there to check it out. After playing photojournalist and interviewing demonstrators for 45 minutes, I went back to the office and filed this story. It was a fun one to write. San Franciscans took to the streets today to express their frustration with banks and a host of other economic institutions. About 200 protestors blocked all three entrances to the Wells Fargo headquarters downtown, chanting, singing songs and waving signs. While the protestors offered a variety of opinions and messages, they all seemed more or less unified around the feeling that most Americans — “the other 99 percent” — are suffering while a tiny minority of the wealthiest see increased profits, reduced taxes and a general lack of accountability for the overall country’s economic health. 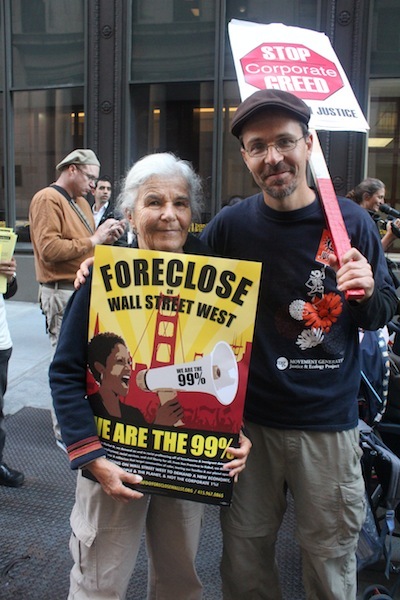 “We’re here because many people have lost their homes because of foreclosures by Wells Fargo,” said Barbara Roose, a Berkeley, Calif. resident who came to the protest with her son and grandson. Full story: Protestors block bank entrance, snarl traffic in San Francisco | VentureBeat. Is it time to occupy Silicon Valley?